Alan Walter was born in 1935 in London, England, and was a young boy there during World War II, while German bombs were falling. Few of us can imagine how it was for young children attending school in London amidst the constant threat of bombings. It was a time of upheaval for a lot of families. Alan’s father was stationed in India, and his mother went to work in the factories, as many women did. Yet even in what some would consider a non-optimum environment, the seeds of a great future were being planted in Alan. He enjoyed the freedoms of being on his own much of the time, an early indicator of his desire to be autonomous and make his own decisions. While school was for the most part a place for Alan to go during the day, a devoted teacher, who was a retired Cambridge University Professor very skilled in story telling, captivated the young boy and his classmates by his descriptions of how ‘all life is a process’. A giant oak tree outside the classroom, the teacher explained, started as an acorn and after a time the sun and water and soil allowed for the acorn to sprout, and over time with more nutrients and the right environment the acorn grew into a mighty oak. Alan would later describe how this early exposure to the concept of a process would empower his own observations of life and how one could create the life of one’s dreams by running the right ‘processes’ or by taking the right steps and actions. Alan and his brother were evacuated to North Wales during the war, as most young children were who were living in London, and lived there for a short time before convincing his parents to emigrate to Australia after the war ended. The grand adventure of sailing on the TMS Ranchi, a luxury liner of the PO Line, opened his eyes to a world he had only dreamed about. 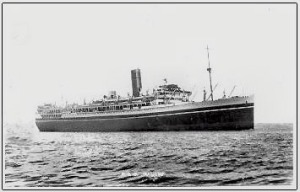 The eight-week voyage in 1948 to Australia included stops at Gibraltar, Port Said; the Suez Canal Egypt; Aden, Yemen; Colombo, Ceylon (now Sri Lanka); Perth, Adelaide and Melbourne. He got to explore and discover the natural world, and even got to go inside the pyramids. He enjoyed a magic, timeless moment while on the roof of the Citadel, an ancient building used as a fort to protect against attacks by the Crusaders. From that vantage point he could see the three major Pyramids and the Sphinx together. It was a memorable moment that stayed with him throughout his life. Many years later he would be studying ancient civilizations and their philosophies, no doubt recalling those settings he had visited as he delved into the origins of the people there and how they evolved as human beings. Not long after he arrived in Australia, Alan found he could not conform to the existing paradigms of education and life. He dropped out of the public school system because he realized he was being taught how he couldn’t or shouldn’t do things—rather than how he could do things. Thus began Alan’s life-long quest for knowledge through self-education and life experiences. Even at that early age, he demonstrated entrepreneurial abilities, leaving home the same day, taking his savings of $30 and hitchhiking to the Outback of Australia where he bought a horse and two dogs and started his own droving business. Soon, the young teenager was making more money in a day than his father earned in a week. 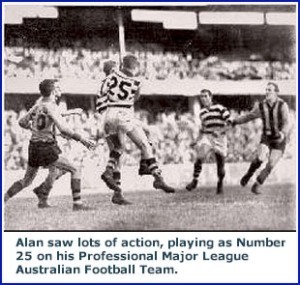 At the age of 19, with no experience, Alan decided he wanted to become a football player. Within 2 years he became a professional, and ultimately became a major league player on the national Australian Professional Football scene. At the same time, he started a manufacturing enterprise, and built a national sales organization, which quickly grew to over 400 sales people. After achieving one of his goals of playing on the Melbourne Cricket Ground to a full house, he travelled back and forth to London for a few years, where he studied personal development. He decided to move to Dallas, Texas, to expand his life and pursue bigger opportunities. He sailed on the Queen Mary and arrived in the U.S. on November 10, 1964. Soon after in 1965, he established Power Leadership International and went on to train and coach many corporations and people throughout the world. Over the years, Alan experienced great success in business, becoming a self-made millionaire many times over. All the while, his continuing interest remained in the field of Human Potential — and he realized more and more that the ultimate development lies in regaining “Spiritual Potential”. Therefore, all areas of Human existence are addressed in his work — Spirit, Mind, and Body. The philosophy and techniques which resulted from his work make it possible for anyone to greatly enhance his or her ability to achieve success in any area of life – whether it be Spiritual, Mental, or Physical. We also use the term today to describe Alan’s technology, which includes his processes, books, lectures, bulletins, articles, diagrams and discoveries that make up his vast body of work. It is at least a generation ahead of any other approach in the human potential field. Knowledgism® is ideal for an individual who is already capable, and who wishes to clearly define their “Purpose” in Life, and to achieve it. Those who gain Mastery in applying this technology not only enjoy dynamically positive lives, they also become proficient in helping others to achieve the same. Alan worked with over 250,000 people, many in Fortune 500 companies, training them to be Champions in their chosen fields. His techniques are known for being very advanced, and very effective. While continuing his study and research, he also conducted special training programs based on his discoveries. Many of these programs continue to be offered today at the home of Knowledgism® in Saint Jo, Texas, and other worldwide locations. Alan devoted the last 25 years of his life to researching, developing and documenting his experiences and discoveries. His legacy is a rich body of work that continues to benefit people around the world, who are studying and applying Knowledgism®, unleashing their potential and increasing their power, wealth, and happiness. 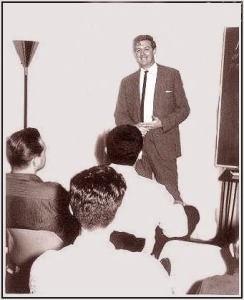 The picture on the right was taken at Alan’s first public lecture in Dallas. The date was November 23, 1964. Alan had just recently arrived in the U.S., and had come to Dallas to create a new, adventurous future. 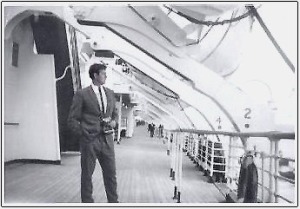 He had sailed from South Hampton in the U.K. to New York and arrived on November 10, 1964 on the Queen Mary. Here is a picture of the historic Queen Mary. Alan’s voyage to the U.S. on this ship wasn’t his first ocean trip, as you’ll see below. In this picture, Alan is standing on the deck of the Queen Mary just prior to his arrival in New York Harbor. This is the TMS Ranchi, a luxury liner of the PO Line. 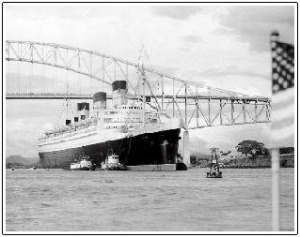 It was the ship which transported Alan and his family from England to Australia, departing on January 20, 1949. Along the way, there were stopovers in Cairo, Egypt; Aden, Yemen; and Columbo, Ceylon (now Sri Lanka). For Alan, a 14 year-old boy eager to learn, it amounted to an exciting, adventurous 3-D series of geography lessons. Alan said, “you can imagine my excitement as a young boy seeing such exotic places in the world”. He got to go inside the pyramids. He saw the Sphinx, and he enjoyed a magic, timeless moment while on the roof of the Citadel, an ancient building used as a fort to protect against attacks by the Crusaders. From the roof of The Citadel (above), Alan had one of his most memorable experiences while in Cairo, Egypt when he viewed the 3 major Pyramids and the Sphinx together. It was a magical time.